As I said in my last post, when the weather doesn't give you crystal blue skies sometimes it's time to turn to "intimate" landscapes. My recent trip to Yellowstone was a perfect chance to practice finding elements of nature that don't include cloudy, featureless skies. 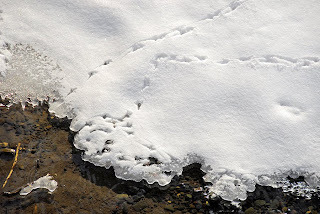 Bird tracks on an icy crust over a stream tell the story of who's been coming to drink. 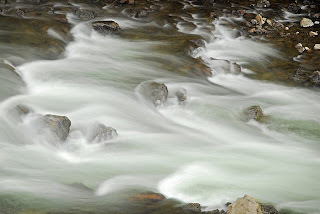 A technique that's particularly effective with a river that has rocks and rapids is a slow shutter speed showing the motion of the water. Stablizing the camera on a tripod and using a shutter speed of 1/8 of a second or longer will give very interesting results. Including foreground objects adds depth the shot, and increases the feel of motion going by the still subjects. Wind can cause havoc with this kind of composition, however. 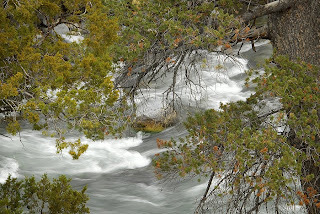 In breezy conditions, you have to find the right balance between a shutter speed that will allow the water to blur, but keep leaves or grass relatively sharp. 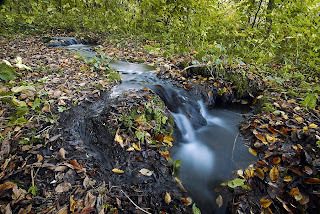 Just to prove that you don't have to travel to some exotic location to use these techniques, here's a version from Sica Hollow State Park near Sisseton. 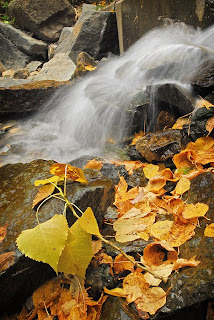 How about a Spearfish Canyon scene, shot at the bottom of Bridal Veil Falls? In the morning I'm headed to Palisades State Park at Garretson and Newton Hills State Park south of Canton. Hopefully the weather will allow me to capture some more of autumn's beauty in South Dakota, but if the skies aren't perfect I'm confident I can still find something to work with.